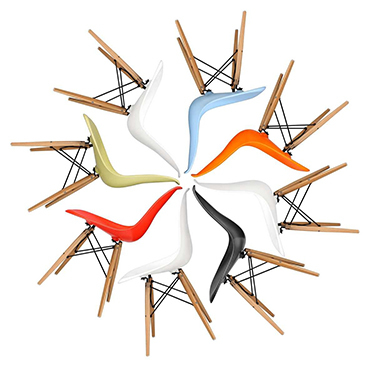 Arne Jacobsen's original Series 7 Chair is one of the best selling modern iconic chairs in the world. The STIN Series 7 Chair is a sleeker development of Jacobsen's Ant Chair. Beautifully moulded for the human body, it is lightweight and easily stackable, making it perfect for modern living. Our handmade plywood reproduction retains all the durability and functionality of the original. Available in several versions, there's a look to suit every home and taste. I bought 4 chairs. The chairs look very much like the original series seven and they are incredibly beautiful. A small minus is that the backs of some of the chairs are a little rough, and that the paint is a bit piled off. That's only small things though.Overall I'm incredibly happy with my chairs. I bought two Series 7 chairs in White oak veneer, and they are beautiful. I really like that I can just about see the wood grain under the paint, rather than it being a completely smooth finish. The matt white effect is also very chic. They are wider/bigger than I expected, which was a lovely surprise. The quality is excellent and they arrived well wrapped and protected. I am absolutely delighted with my purchase! I'm super happy and satisfied with my purchase. Amazing quality and design. Looks exactly the same as the original. Definitely not my last purchase from OSKAR! Very nice Chairs and very helpful customer service. My experience with Stin was great! Hi the order arrived on time and everything seems fine. Only problem is that it seems as the tree is a bit soft so it is recommended from the start to buy some cushions for the chairs. I'm super happy and satisfied with my purchase. Amazing quality and design. Looks exactly the same as the original. Definitely not my last purchase from Stin! Very nice Chairs and very helpful customer service. My experience with OSKAR was great!